Full Game Review of Hunky Heroes Hunky Heroes - An action-packed 5-Reel, 9-Payline Multi-Coin Slot offers plenty of rewards including the Sneak A Peek Bonus Game and cumulative Free Spins + Multiplier Bonus. Full Game Review of Doctor Doctor Doctor Doctor - Set in a busy hospital, this adrenalin fuelled 5-Reel, 9-Payline, Multi-Coin Slot boasts a medicine bag full of unique features, including the innovative Sneak a Peek Bonus Game and cumulative Free Spins + Multiplier Bonus. A prescribed base Jackpot of $10,000 is possible and a further $100,000 can be won in the no-limit Free Spins + Multiplier Bonus Feature. 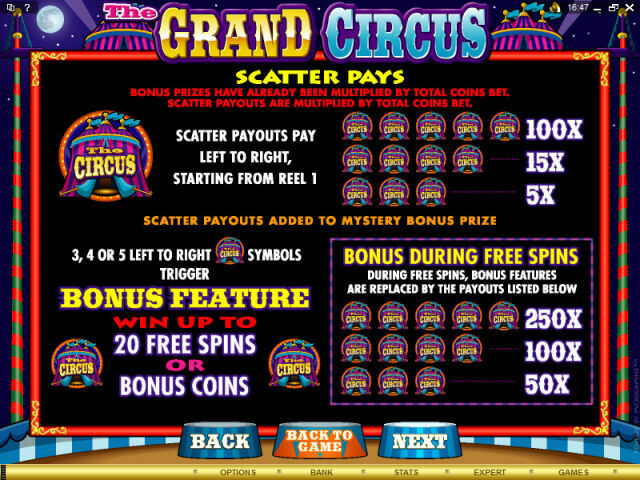 Full Game Review of Grand Circus Grand Circus - Roll up, roll up and enjoy all the fun of the fair in our brand NEW 5-Reel, 20-Payline, Multi-Coin Video Slot � The Grand Circus!